Le Shuttle / Ferry from Folkstone / Dover to Calais. Guided tour of Versailles Palace. Orientation Tour including the Grand Place, Mannekin Pis. BLACK FOREST: Visit Drubba Cuckoo Clock outlet; Enjoy the scenic drive. Cable car ride to Mount Titlis. Train Journey to Jungfraujoch - Top of Europe excursion. Visit to Rhine Falls at Schaffhausen. INNSBRUCK: Orientation Tour including the Hofburg and Golden Dachl. WATTENS: Visit to Swarovski Crystal Worlds and Museum. VENICE: Private Boat ride to St. Mark’s Square, visit St. Mark’s Square - see the Bridge of Sighs, Doges Palace and the Basilica di San Marco, Gondola Ride, demonstration at Murano Glass Showroom. PISA: Visit Field of Miracles – see Cathedral, Baptistry and Leaning Tower. FLORENCE: View of the city from Piazzale Michelangelo; Guided Walking city tour. 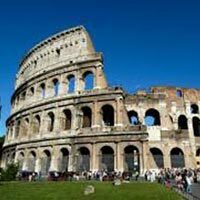 ROME: Guided City Tour including a visit to the Vatican Museums and St. Peter’s Basilica. Choice of Local Meals in 05 different places. 02 nights at Hotel Crown Plaza / Heston Hyde / Radisson Blu or similar in London. 03 nights at Hotel Novotel / Residhome / IBIS Styles or similar in Paris. 01 nights at Hotel NH / Carlton De Burg or similar in Belgium / Netherland or similar. 01 night at Hotel Micheal / NH / Achat Plaza or similar in Heppenheim / Mannheim. 03 night at Hotel Seedamm Plaza / Thessoni / Amaris / Apart hotel by Hilton or similar in Central Switzerland. 01 night at Hotel Alp / Bon Alpina / Kronen or similar in Seefeld / Innsbruck. 01 night at Hotel Europa / Unaway / NH or similar in Occhiobello / Rovigo or similar. 01 night at Hotel A Point / Meditur / Da Vinci or similar in Tuscany or similar. 01 night at Hotel Best Western / Antonella / Melia or similar in Rome. Return Economy Class group airfare as per itinerary (Presently calculated as prevailing on 15th November 2017). Cost of your ticket taxes (Presently calculated as prevailing on 15th November 2017). Normal insurance charges for the duration of the tour are included in the tour price. However, any passenger above the age of 60 years and those passengers who wish to extend their stay will be required to pay additional charges. Multiple entry Schengen visa. The costs of UK and Schengen visas are included in your tour price. This cost includes documentation, processing and consulate fees. Tips to coach drivers for the duration of the tour is included.The cost of the Passport, POE charges, etc. Day 1: Fly into London, the financial, political and cultural heart of Britain. Ride the London Eye. Welcome to one of the world's most visited cities - London. Meet your friendly Travel Professional outside the baggage hall and proceed to our hotel. Check in and relax for a short while. Later we will proceed to London Eye, which stands at 135 meters tall overlooking the river Thames. Get splendid views of the city while you take a 30 minute ride and get a different glimpse of London. Day 2: Guided city tour of London with Changing of Guards. Visit to the famous Madame Tussauds wax museum. This morning we proceed on a city tour with our expert local guide. We will visit important landmarks like Hyde Park, Big Ben, Houses of Parliament, Westminster Abbey, Trafalgar Square, Piccadilly Circus, Buckingham Palace, Tower Bridge, River Thames, and many more. We will witness the Changing of the Guards at Buckingham Palace (subject to operational). Next we proceed to Madame Tussauds wax museum. Be enthralled by world’s largest wax collection and don’t forget to take a photograph with one of the famous personalities present. Check out of your hotel. We travel by Le shuttle / Ferry to Paris- The fashionable and elegant city known for its haute couture, renowned museums, breath-taking beautiful monuments and sensational cabarets. On arrival in Paris, proceed on a fascinating city tour. Marvel at the finest Parisian sights – the Champs Elysees, Alexander Bridge, Invalides, Arc de Triomphe, Concorde Square, Opera House, and several others. we proceed to the city of Lisse to tour the legendary Kuekenhof Gardens (till the 12th May), tulips, daffodils and hyacinths create dazzling patches of colour. The park is said to be the greatest flower show on earth (from 13th May) proceed to Den Hague to visit Madurodam, a miniature park to see a range of perfect 1:25 scale model replicas of famous Dutch monuments and projects. Day 7: Amsterdam with Canal Cruise. Proceed to Cologne - the largest Cologne Cathedral. Check out and proceed on a cruise of the city of Amsterdam in your glass-topped boat, drifting through the canals. Thrive on the city’s vibrant past with its 1,000 bridges and quaint old houses. Next we proceed to Cologne, famous for its Eau de Cologne. Here you will visit the imposing Cologne Cathedral, a Gothic masterpiece with its 515 feet twin towers, a World Heritage site and the largest cathedral in NorthernEurope. After check out, relax in your coach as we drive to the heart of the Black Forest, known for its picturesque woods, consisting of pines and firs. You will be enthralled at the scenic beauty of the quaint villages in the heart of Black Forest region. Witness a demonstration of how cuckoo clocks are made. Sit back and enjoy the scenic beauty as we drive towards Switzerland. We halt at Schaffhausen, where you see the magnificent Rhine Falls - Europe’s biggest and most spectacular falls. Today’s magical Alpine excursion is to Jungfraujoch -the Top of Europe. Board a cogwheel train to reach the highest railway station in Europe at 11,333 feet, to an Alpine wonderland of ice and snow. Visit the Ice Palace and experience a breath-taking panoramic view from the Sphinx Observation Terrace and view the longest glacier in the Alps - the Altesch Glacier. Later we drive to Interlaken, a unique and fascinating city situated between two lakes of Thun and Brienz. This morning, we drive to Innsbruck. On an orientation tour of this beautiful city, see the Golden Roof with its gold plated copper tiles, a characteristic landmark of Innsbruck, walk down cobblestone pathways of Maria Theresien Strasse and re live medieval European culture. The splendid Alps in the background provide a perfect picture-postcard setting. Later we will proceed to Wattens, to visit the Swarovski World of Crystals and marvel at the crystalline works of art. A great opportunity to buy a souvenir for your family. Check out of your hotel and we proceed towards Italy. Arrive at the pier in Venice, where we board a private boat. Enjoy your Indian lunch on board while you sail over the Guidecca Canal, past the Adriatic Sea to arrive at St. Mark’s Square – the main square of Venice, where the only traffic is that of humans and pigeons! St. Mark's Basilica, is one of the best examples of Byzantine architecture anywhere in the world. The famed Bell Tower and the Clock Tower, display not only the time of day, but also the dominant sign of the Zodiac and the current phase of the moon. Continueon to the Bridge of Sighs, made of white limestone, that passes over the Rio di Palazzo, connecting the old prisons with interrogations rooms at the Doge's Palace. Treasure a romantic gondola ride, in a flat bottomed Venetian rowing boat, amidst the stunning backdrop of baroque buildings. This truly is one of the best ways to enjoy this enchanting city. Also witness a Murano Glass demonstration and marvel at the intricate and colourful glass artefacts, hand-crafted by master craftsmen. We return to the pier and later proceed for dinner. Day 13: Guided city tour of Florence. A visit to the remarkable and famous Leaning Tower of Pisa. father of the Italian language, are buried. Next, drive to Piazzale Michelangelo to get a spectacular city panorama, later we proceed onwards to Pisa –the Square of Miracles and see the remarkable Leaning Tower of Pisa. Don’t forget to take a photograph of yourself with backdrop of Leaning Tower and the square. your shoulder gets you back to Rome. 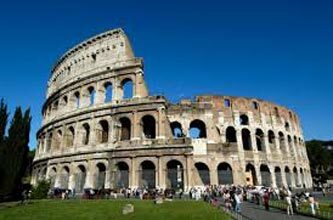 We continue and drive past the Victor Emmanuel Monument, the Roman Forum, and several more sights of this remarkable city. Day 15: Fly back home. Your Holiday ends. Today it’s time to fly back home. Check out and depart for the Airport for the flight home. All local taxes and services (Presently calculated as prevailing on 15th November 2017). Third person in a Triple room will not be provided by extra bed or cot. It is advisable to book more than 45 days prior to the tour departure date as the internal ticket rate might increase closer to the departure date, resulting in an increase in the Tour cost The airfare is based on the existing fare structure (Presently calculated as prevailing on 15th November 2017). Any further increase in the airfare due to an increase in fuel price, change in government regulations, ticket taxes etc. charged by the airline will have to be borne by the passenger. We will not be held responsible for the same Any damage caused to the hotel rooms or coach during your stay shall be Pay able by the passengers. We will not be liable for the same The management reserves the right to claim from the passengers, any additional expenses incurred due to delay or changes in the schedule of trains, flights, coach, cruise or other services We reserve the right to amend, alter, vary or withdraw any particular departure, excursions advertised or substitute a hotel of similar class if deemed necessary The images used in this brochure are for representation purposes only A date change fee, as applicable, will be levied on passengers who change their date of travel For the convenience of our passengers, we may sometimes will have to amend the itinerary. However all services will remain the same The company reserves the right to alter the order of the itinerary. The same will be informed to the client before departure Due to Trade Fairs and conventions in the cities, it is possible that the hotel accommodation provided would be outside the city. The same will be informed in advance Passengers can board the tour from the hub city. Those boarding from any other city can do so, however all expenses to/from the hub city is to be borne by the passengers Attractions in the theme parks may not operate/may change/entry restricted/closed without notice Other applicable taxes will be extra The company shall not accept any liability or responsibility for any damages, loss, injury, accident, death, delay, breakdown or irregularity, which may occur in carrying out of the tour arrangement due to weather conditions, strikes, war, quarantine and any other cause whatsoever and all such loss or expenses must be borne by the passenger For all Joining Direct/deviating clients (except when deviating clients are on same flight as that of group) , there would be no airport transfers. Tours operated subject to RBI/GOI regulations Part of the tour cost is payable in EURO out of your BTQ. The foreign exchange component will be payable as per the prevailing day rate of exchange on the date of payment of foreign exchange When the outbound sector of an Ex-India ticket is not utilized, the return segment cannot be utilized for one-way travel and there will be no refund for non-utilisation Please refer to the booking form for detailed “Terms & Conditions”.